Hello friends, family, and those who would like to help. My name is Sopeant Chuop (Pon or Cuck). 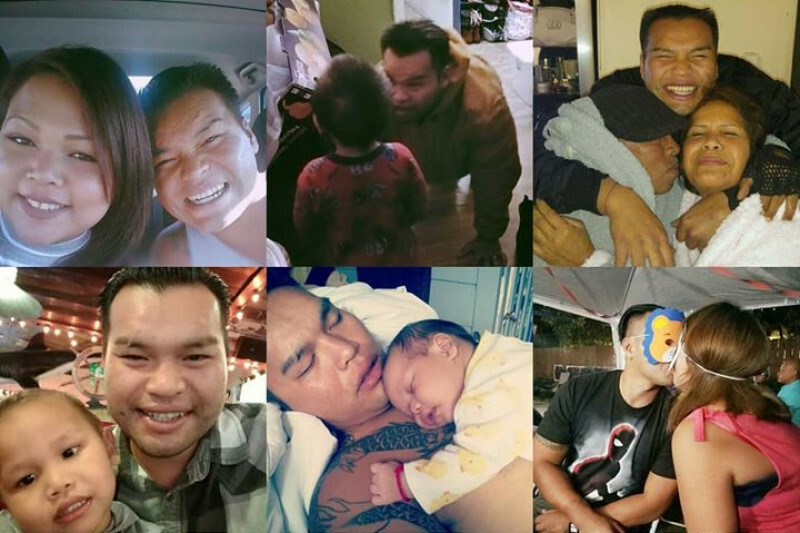 My Husband, Phann Pheach (Theoun) is currently fighting his case in order to stay here in America, where he truly belongs, with his family.. He was born in a refugee camp in Thailand and came to the U.S. at the age of one in 1984 as a Cambodian Refugee. He grew up in a bad neighborhood, which inevitably, guided him to do drugs because he wanted to “fit in”.. However, this specific conviction in 2005, is unjust.. They charged him for selling, when it was a mere possession, and made him plead guilty to a crime he did not commit, due to improper guidance.. Because of this, he is now facing deportation to Cambodia, a place he never once knew.. Now, over 10 years down the line, this conviction has finally caught up to him, and it’s not right.. I need to find justice for my husband, for his friends, for his family.. and legal representation is all we are counting on right now.. Ever since his last conviction in 2005, he has lived an upright life. He reformed himself-obtained a strong foundation with a stable job, supported his wife, son and mother.. He is the glue that holds his family together, he is the bright-minded, selfless person, that we all love so dearly.. He built a strong bond with family and dear friends.. Lately, we have had so many downs in life- with my mother-in-law’s health concerns and mental stability, my 3 year old son, Torenny, with his 2 heart conditions, which may require surgery in the future… Not to mention, the tragic death of his late father in 2016.. Now this? Our family is small as is, and we don’t need to make it any smaller! We need a miracle.. We need faith, help, and support. My husband deserves his second chance in life! I am crumbling apart without my husband, who I have been with for over 10 years.. I am left to care for our son and my mother-in-law. I fight by educating myself with the laws and its terminology, political statuses, and media outlets that focuses on these issues but there's only so much research and reading that I can do to make an impact. I need legal assistance and as a now, single income mother who only works part-time, I can no longer afford the cost of living, along with the legal battles ahead. My husband is currently detained, and Homeland Security likes to move quickly.. Retaining a knowledgeable lawyer is crucial and subject to time sensitivity. I am a believer of "being grateful for what you have" so $1.00 would make a difference or even a support letter. I'm drowning not only emotionally anymore, but also financially as well. We pray, hope, and fight that we do not lose Phann (Theoun), as it will be detrimental to his family and close friends.. He has served his time and changed his path.. Forcing him to depart from America-away from his home, is just like a life sentence.. We thank you for your support, time, and effort. We will be forever grateful. Great news! My husband has been granted a Governor's Pardon. This is powerful as it gives us an actual oppertunity to continue to fight his immigration case. The criminal case has been resolved. Now is the next battle: Immigration Court. Phann is still currently detained. He was transferred to Texas to await the charter flight that would have deported him to Cambodia this upcoming Tuesday. Our immigratoin attorney did an amazing job. Once I told her about the pardon, we both were in shock and we screamed and I cried. She told me her fight is just beginning. She was able to stop my husband's deportation order by flying to AZ that same night. She slept for only two hours to make sure she had a presentable motion! It was over 100 pages. Now we are waiting for him to be transferred back to California. Our attorney is passionate and tough. I'm so happy she is on our side. The battle was won but we are still fighting the war. Thank you for all of the donations, shares, and initiative to read about us. I found an attorney from Pasadena who is currently evaluating Phann's case. The evaluation process will take two weeks or so.